On a quiet suburban street, a babysitter must defend two twelve-year-old boys from intruders, only to discover it's far from a normal home invasion. Another stab – ha ha! 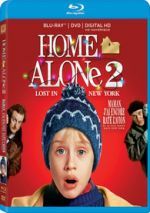 – at Christmas-themed horror, 2017’s Better Watch Out offers a bloodier twist on the Home Alone model. Teenage Ashley (Olivia DeJonge) takes the gig to babysit 12-year-old Luke (Levi Miller). This ordinary evening takes a dark turn when mysterious perpetrators stage a home invasion. Ashley and Luke fight back while they also discover the deeper intentions of the perpetrators. It might be a mistake to view Watch as a horror film, for it likely fits the thriller genre more appropriately. When I think “horror”, I lean toward something with a bit more supernatural tendency, while this film stays firmly based in real-life. Whatever genre into which one places Watch, it provides a surprisingly deft production. It takes clichés and manages to turn them on their ears, efforts that manage to keep the film fresh. That seems especially important because so much of Watch feels destined to follow certain paths. The entire first act exploits these genre traits to leave the viewer with the feeling it’ll make predictable developments and choices. Happily, Watch manages to throw plenty of curveballs our way, all of which allow it to become a fun ride. Sure, these veer firmly into the realm of the improbable – nay, the borderline unbelievable – but I admit I don’t really care in this case. Face it: plot holes and illogical choices tend to become an issue mainly when a movie lacks much sizzle. If the film offers an enjoyable experience, the viewer seems more likely to forgive these slips. That happens with Watch, as its pros outweigh its cons. A lively, brisk genre effort, the movie gives us a good ride. Better Watch Out appears in an aspect ratio of approximately 2.35:1 on this Blu-ray Disc. This became a largely pleasing presentation. For the most part, sharpness seemed satisfying. The movie didn’t boast stellar clarity and could seem a smidgen tentative, but the image was mainly well-defined. I saw no signs of shimmering or jagged edges. Neither edge haloes nor print flaws interfered either. In terms of palette, Watch favored an amber tone with splashes of teal during more intense scenes. Like sharpness, these elements didn’t dazzle, but they felt perfectly acceptable to good. Blacks seemed dark and deep, while shadows appeared smooth and clear. Though never dazzling, the image worked fine. I felt the same about the fairly decent DTS-HD MA 5.1 soundtrack of Better Watch Out, as it opened up in a reasonable manner. Music provided nice stereo presence, while effects added a little pizzazz. The creepy sequences became the most involving – they didn’t do a lot, but they brought out some impact. Audio quality worked well, with natural, concise speech. Music became full and rich, while effects appeared accurate and dynamic. The soundtrack suited the material. In addition to two trailers, we get a Making Of documentary. This program goes for 52 minutes, 41 seconds and involves producers Brian Hambel, Sidonie Abbene and Paul Jensen, writer/director Chris Peckover, executive producer Shane Abbess, and actors Olivia DeJonge, Virginia Madsen, Levi Miller, Ed Oxenbould, Dacre Montgomery, Patrick Warburton and Aleks Mikic. “Making Of” looks at story/characters, cast and performances, sets and production design, stunts and effects. With almost an hour at its disposal, I hoped “Making Of” would offer a strong look at the production. Unfortunately, it remains oddly insubstantial across its running time. We get a smattering of insights and useful elements, but the show remains surprisingly bland much of the time. The disc opens with ads for Triple Threat, Bad Day For the Cut and The Villainess. A second disc provides a DVD copy of Watch. It includes the same extras as the Blu-ray. 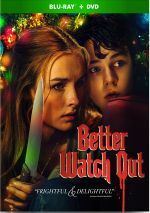 A clever twist on the “home invasion” genre, Better Watch Out offers a brisk adventure. A nice mix of twists and excitement, the movie manages to give us an enjoyable effort. The Blu-ray comes with generally good picture and audio as well as a mediocre documentary. Watch works as unusual holiday entertainment.